Popcorn and beer ready. Shapo will avenge Canada's loss to the United States in Women's hockey. Redemption can only be achieved when Genie beats Serena...it's a female only vendetta. Shapo has made four slice ROS in the match at 3-4. So he DOES have a slice! both are serving fairly well and backing it up once they get the offensive initiative, so it looks like it'll be one of those tight affairs that will swing for whoever is able to grab a chance once it presents itself. Mauve is easier on the eye than pink. Is this a serve+1 match so far? Floats it too much. Has to get that block return. Shapo to serve for the first set with a great DTL backhand! His BH return is on par with Roger's in 1999-2000. I agree with what you say, but he'll get it nailed down, just as Roger did. Denis takes the first set! I'm not expecting Shapo to have much trouble tonight. Meanwhile Verdasco is beating Thiem in Rio! I just don't know if Shapo can beat Chung, I don't think he's quite ready. Chung makes so few UE's and Denis can be really erratic off the ground. Wow! Verdasco at times, can do no wrong! He is such intermittent time player. If he is on his game; he can do a lot of damage! I just don't think Shapo can beat Chung, I don't think he's quite ready. Chung makes so few UE's and Denis can be really erratic off the ground. Agree with the prediction. Other than the first serve, Taylor's rally balls don't seem to have enough on them to bother Denis much. It's a ways from #46 to #30. Except for 1st serve Chung wins in all departments. Don't know, we are seeing a new and improved Shapo. Shapo two straights aces to erase two BP's! Shapo is the real deal... future #1! Shapo one game away from the win. Nice patient play there by Denis. Shapo in the semi vs either Chung or Tiafoe. 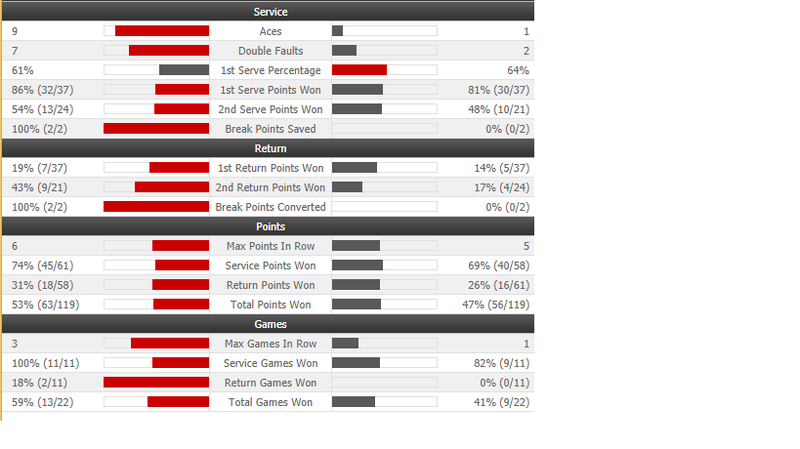 Almost half of the lost points on serve were doublettes. I seriously think he's gonna be in trouble on clay. Watching Denis's return is sometimes real pain but he is through. Serve OK (too many DFs, yet still 54 % of second serve won, therefore probably good enough), little erratic from the ground. No TB, that's good. Just one break per set is somehow standard Denis, on the other hand to win 2 return games with just 18 return points won is clutch job. Fritz played some good tennis however in few service games left some opening and Denis used them. And on return just wasn't good enough. 2nd ATP semifinale of Denis's career, good for him Probably Chung (would be favourite), maybe Tiafoe (Denis would be favourite). Will see. I think we are seeing a different Shapo now, more conservative with a reserve of when to go for it. I'm thinking he's gonna win this thing. Does anyone have a streaming link that doesn’t lag? Thanks.